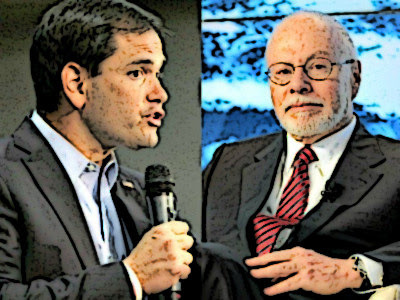 Hedge-fund billionaire Paul Singer’s decision to throw his financial weight behind the donor-class 2016 favorite, Sen. Marco Rubio (R-FL), has sparked fresh questions about Rubio’s coziness with the financial interests funding his career. As Politico reported at the time, Singer “quietly go[t] involved in the fight for immigration reform, making a six-figure donation… to the National Immigration Forum”— a George Soros-backed organization that lobbied for Rubio’s legislation to issue 33 million green cards to foreign nationals in the span of a single decade. The announcement of Singer’s endorsement highlights an intra-party tension that has emerged with new strength since Rep. Paul Ryan (R-WI)’s inauguration as Speaker of the House. There is a growing chasm between the more than 9 in 10 GOP voters, who want to see future immigration rates cut, versus GOP donors that are desperately seeking to install leaders in the White House and Congress who will further expand the nation’s already record breaking immigration rates that are transforming the country’s economy and electorate. I see Marco Rubio just landed another billionaire to give big money to his Superpac, which are total scams. Marco must address him as ‘SIR’! Even though Rubio’s donors stand to make an enormous profit from a surge of low-wage migrant labor, Rubio has repeatedly denied that his wealthy backers have influenced his agenda. “People buy into my agenda. I don’t buy into theirs,” Rubio has said. However, a review of several of Rubio’s top donors reveals that many of them have benefited from the Floridian’s rise to power. Perhaps one of the most widely-criticized areas of Rubio’s campaign pledge to create “A New American Economy” on migrant labor is his support for tripling the controversial H-1B visa program. Throughout his brief time in Washington—noted primarily for pushing the La Raza and Obama-backed amnesty bill through the Senate—Rubio has co-authored two pieces of legislaton that would massively expand the wage-depressing H-1B visa program used to replace American workers in white-collar jobs. His most recent bill—known as I-Squared—would triple the number of H-1B visas imported into the United States despite the fact that the U.S. Census Bureau reports 3 in 4 Americans trained in Science, Technology, Engineering, and Math (STEM) are not employed in those fields. The Walt Disney Company used H-1Bs to lay off hundreds of American workers and forced them to train their low-wage foreign H-1B replacements. Disney’s CEO has endorsed Rubio’s I-Squared bill. Lobbyists write the rules to benefit the rich and powerful. They buy off Senators like Marco Rubio to help them get rich at the expense of working Americans by using H-1B visas–so called “high tech” visas–to replace American workers in all sorts of solid middle class jobs… Senator Rubio works for the lobbyists, not for Americans. That is why he is receiving more money from Silicon Valley than any other candidate in this race. He is their puppet. According to open-secrets, Goldman Sachs has been one of Rubio’s biggest financial boosters. Since 2011, Goldman Sachs was the top donor to Rubio’s campaign committee, contributing $53,200. Interestingly, Goldman Sachs is also among the top 50 corporate users of the H-1B visa, which labor experts call an “indentured servitude” program. According to USCIS data analyzed by Computerworld’s Patrick Thibodeau, Goldman Sachs is the ranked number 33 among the biggest users of the program. Behind Goldman Sachs, Microsoft is the second largest contributor to Rubio’s campaign committee since 2011, donating $33,100. Similarly, Microsoft is the 12th biggest user of the H-1B program, having brought in 1,048 foreign workers on H-1Bs in 2013. Last year, Microsoft announced its plans to lay off 18,000 workers at the same time the company was lobbying to increase the H-1B program, prompting strong condemnation from U.S. Senator Sen. Jeff Sessions (R-AL), a top opponent of Rubio’s H-1B expansion plan. Morgan Stanley has also been one of Rubio’s top financial contributors— having donated $47,564 to Rubio throughout his career. Morgan Stanley is the ranked 66th among the biggest H-1B users. Larry Ellison, the founder and executive chairman of the Oracle Corporation, has been another one of Rubio’s financial boosters. In July, the WSJ reported that Ellison gave $3 million to the pro-Rubio super PAC. In June, Ellison hosted a $2,700 per-person fundraiser for Rubio. Oracle is the 20th biggest users of H-1B and has endorsed Rubio’s Gang of Eight and I-Squared immigration bills. Beyond the controversial H-1B expansions, however, critics allege that Rubio’s donors have benefited in other ways from his immigration legislation. For instance, according to open-secrets, Carnival Corporation is one of the top 20 contributors to Rubio’s campaign committee since 2011, having donated $14,500. According to the Federation for American Immigration Reform, Section 4606 of the Rubio-Obama immigration bill included a “backroom deal” that, “creates a new nonimmigrant Z visa to admit individuals who possess ‘specialized knowledge’ to perform maintenance on airlines and cruise ships” in place of American labor. Rubio’s top immigration lawyer during the Gang of Eight push was Enrique Gonzalez. Prior to working for Rubio, Gonzalez had formerly made his living, in part, by bringing foreign workers into the country on behalf of large corporations. Gonzalez had been a partner at the nation’s largest immigration firm Fragomen, where, as Bloomberg reports, “he helped Carnival, Viacom, and other companies obtain visas for their foreign workers.” Gonzalez features this Bloomberg article on his profile on Fragomen’s website. Yet beyond Rubio’s legislative action on immigration, reports document how Rubio’s donors may have shaped many more of his policy platforms. While the Fanjul family has reaped the benefits of a protected sugar industry, other Americans have paid a price in lost jobs… What we have is a special interest group with lots of political muscle to protect its industry – to the detriment of 120,000 U.S. jobs lost over the past fifteen years. Multiple reports have documented how the Fanjuls may have influenced Rubio’s votes. For instance, the Washington Post has described Rubio as a “major player” and one of sugar industry’s “names to know”. Rubio, an outspoken defender of the sugar program… courted the Fanjul family during his 2010 Senate campaign. In his 2012 memoir, “An American Son,” Rubio credited a Fanjul fundraiser on Labor Day weekend in 2009 for helping him surpass a critical early fundraising goal. This year, 60 supporters paying $10,000 each gathered on the terrace of Pepe Fanjul’s Palm Beach home to toast Rubio. “The Fanjuls might be considered the First Family of Corporate Welfare… they benefit from federal policies that compel American consumers to pay artificially high prices for sugar,” says a report by Time Magazine’s Donald Bartlett and James Steele. The news of Singer’s endorsement may bring Rubio additional endorsements. Another donor Rubio has actively courted is Sheldon Adelson, CEO of the Las Vegas Sands Corporation. Reports have questioned whether Rubio’s support for Sheldon Adelson’s bill to stop Americans from gambling online was intended to woo the GOP megadonor. Adelson stands to benefit financially from Rubio’s policy of expansive immigration as well. Indeed, Nevada has the largest share of illegal immigrants of any state in the country (4.7 percent), and roughly one in five Nevada residents is foreign-born.